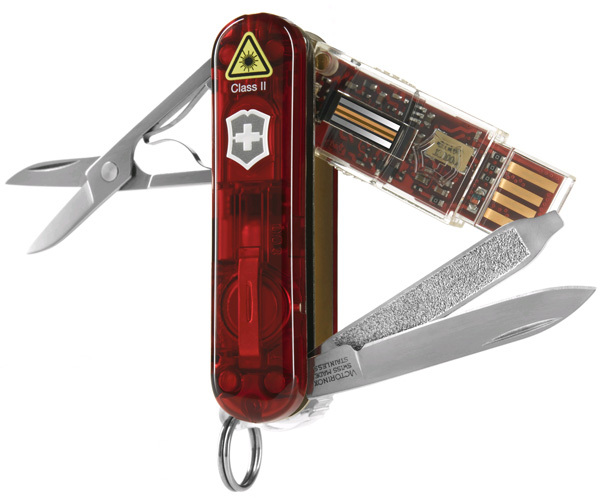 Makers of the legendary Swiss Army Knife have joined silicon with steel more than once in the long history of the multitool, but the latest one employs old-school security features that even the most sophisticated USB thumb drives lack. Victorinox’s new Secure includes all the usual Swiss Army essentials, including a blade, nail file and scissors, plus a mini flashlight and flip-out USB thumb drive with a biometric fingerprint reader. Besides sensing heat with every fingerprint to ensure the fingerprint is legit (and not that of a severed thumb, perhaps severed by the knife itself?) the Secure will actually self-destruct if hackers attempt to physically force their way into it. According to Victorinox, both the drive’s CPU and memory will fry when the case is compromised. The Victorinox Secure went on sale March 25 exclusively in the U.K., with a flight-friendly bladeless version available as well. In comes in capacities between 8GB and 32GB, priced between £50 and £180 ($75 and $269 USD).